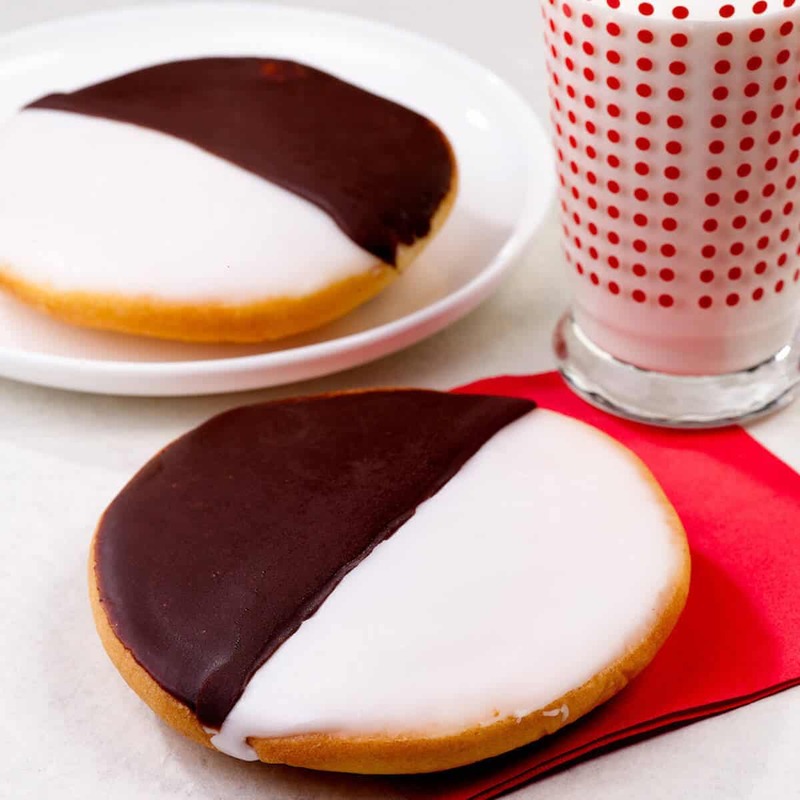 For the uninitiated (ok…me), a Black & White cookie are those you see in bakeries and corner delis that have black & white icing (one on each side) on a soft, cake-like cookie. Usually jumbo-sized, they have a slight lemony flavor that balances out the sweetness of the icings. For the record, these aren’t my go-to cookies when I head into a bakery (give me something in the rugelach family, please), but when they were kids, David & Erik (aka my Son-in-Law and the birthday boy) would have them on the train when returning from visiting their dad at work in New York City when they were kids, so…good times, good memories. Apparently, turning this iconic cookie into a full-blown Black & White Cookie Cake is a thing, and quick search landed me on a recipe from Take a Megabite. Although this recipe was written to yield a 6-inch cake, I doubled the amounts to make a standard 9-inch cake. When you’re serving two over-6-foot men (and three other, shorter people), you want to be sure to have enough! 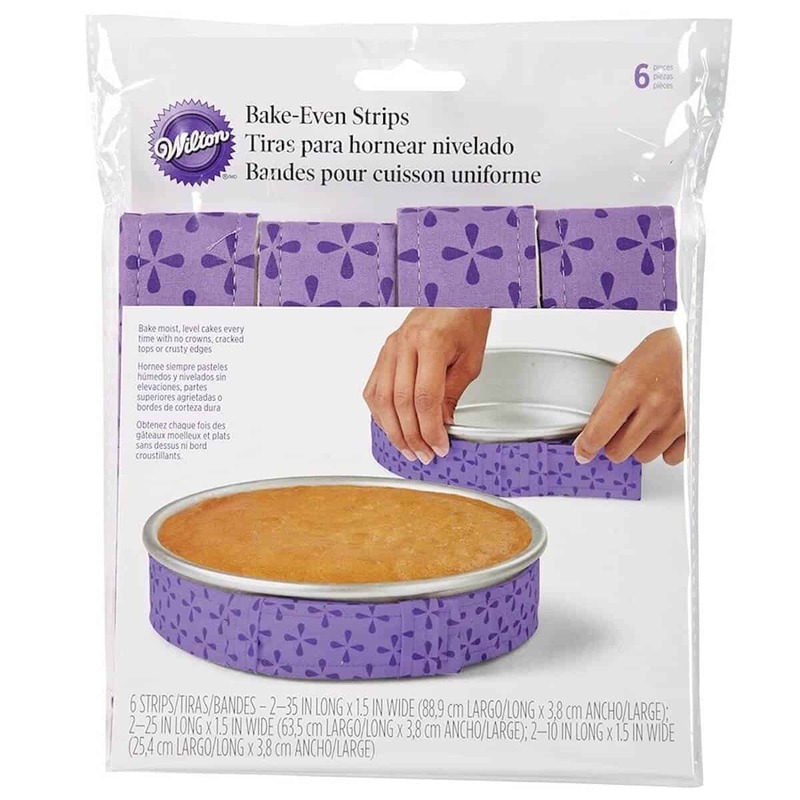 Another important tip – I used Wilton’s Bake-Even Strips to insure the baked cake layers stayed level. What do I mean? Well, you know when you bake a cake, it generally has a dome on top, and if you want to stack those layers, you have to level the cake by cutting off the dome, otherwise the layered cake sags (this effect was really noticeable when I made my Checkerboard Cake last year for our Super Bowl party). The doming happens because the outside of the cake bakes and sets faster than the inside, so the middle has more time to rise. 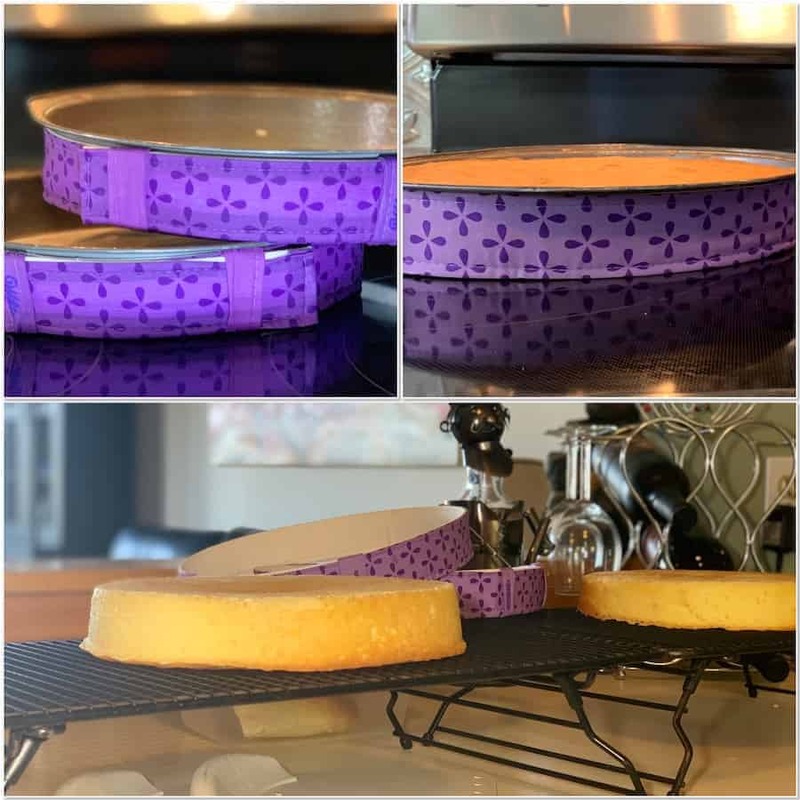 The Bake-Even Strips solve this problem by insulating the outside of the cake, thus allowing the cake to bake evenly. End result…level cakes! (and there was much rejoicing) Bottom line: use these strips…you won’t be disappointed! Don’t forget about the all-important icing! Line the bottom of 2 (6-inch) cake pans with buttered parchment paper. Position rack in the middle of oven and preheat to 350°F (177°C). Soak the Bake-Even Strips in cold water for 5 minutes, then rap around the outside of the cake pans. Reduce the speed to low and beat in one-third of the flour mixture, then half the buttermilk (or sour cream/water mixture), stopping and scraping down the bowl and beater after each addition. Beat in another third of the flour, then the remaining buttermilk, stopping and scraping again. Finally, beat in the remaining flour mixture. Scrape the bowl well with a large rubber spatula. Pour the batter into the prepared pans and smooth the tops. Stir together powdered sugar, corn syrup, lemon juice, vanilla, and 1 tablespoon water in a small bowl until smooth. Transfer half of icing to another bowl and stir in cocoa, adding more water, 1/2 teaspoon at a time, to thin to same consistency as white icing. Ice the bottom layer half white and half black and place the top layer on top using cake lifters. Frost the opposite sides of the top layer white and black so you’ll get both black & white icing in every bite. I’ve mentioned my buttermilk hack before: equal parts water and sour cream (or plain Greek yogurt). You can also use 1 cup of milk, takeout 1 tsp and replace it with 1 tsp lemon juice or white vinegar. The purpose is to give an acid for the baking soda to react with. The proof is in the…uhm…layers. Nice even layers! Chocolate and vanilla icing in every slice! p.s. The Earth has gone once more ’round the sun since I started this blog, my 2nd blog-versary, as it were. Thanks for your continued support for this, my labor of love. Here’s to another year of happy baking and happy tasting!